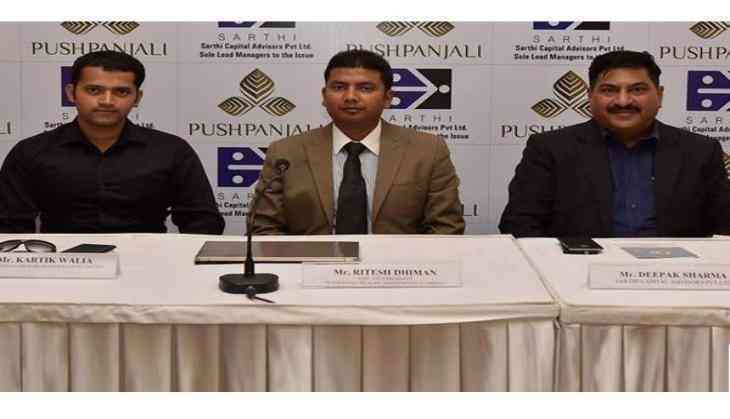 Pushpanjali Realms and Infratech Limited, which is engaged in real estate development in Dehradun, Uttarakhand, is entering the capital market with its initial public offering. The issue, which will open on 27 June 2017 and will close on 30 June 2017. Pushpanjali Realms and Infratech Limited proposes to raise Rs. 14.55 crores through the issue of 26,46,000 shares of face value of Rs. 10/- each for cash at a price of Rs. 55/- per equity share. The equity shares are proposed to be listed on the Emerge Platform of National Stock Exchange of India Limited (NSE). Sarthi Capital Advisors Pvt. Ltd. is the sole Lead Manager for the issue. Bigshare Services Pvt. Ltd. is the registrar to the issue. Pushpanjali Realms focuses on construction and development of residential projects. The residential portfolio currently covers projects catering to customers across all income groups in Dehradun, Uttarakhand. The Company proposes to utilise the funds, which are being raised towards meeting the working capital requirements. The company has two on-going residential apartment projects in Dehradun, Uttarakhand, namely 'Orchid Park' in Tarla Nagar and 'Eminent Heights' in Balbir Road. Project 'Eminent Heights' is expected to be completed in FY 2017-18 and project 'Orchid Park' is expected to be completed in FY 2019-20.